RoboForex Company welcomes You , and is happy to inform you about our thread on this website, which contains the official support for our customers. Here we are going to post top news and announcements, information on our special offers and help of our customer service representatives. Our main advantages are: the fastest order execution based on STP technology, the wide range of trading tools, the different account types and the great list of payment systems for cash replenishment or withdrawal. The company has FSP and FSCL licenses which proves the legitimacy of the providing services and guarantees the professional level of customer service and safety of the investment assets. We wish you a successful trade and invite you to cooperate with us. cTrader trading platform is based on the NDD (Non Dealing Desk), technology, which enables Direct Market Access (DMA). This technology includes no dealers, re-quotes, or any delays in order execution, and guarantees clients’ order execution in the STP mode. More detailed information can be found in the correspoding section of our website, "cTrader platform". From March 11th to March 31st, 2013, trade on metals will be opened and closed 1 hour earlier on server time. Trading server time: 00:00-23:00. From April 1st to October 27th, 2013, trade on metals will be available within the operating range of the contract specifications. Trading server time: 01:00-00:00. It’s been a month since we started an international contest project called ContestFX. We’d like to remind you that the main purpose of the project is to provide the traders with an opportunity to improve their trading skills by taking part in different demo account competitions. Since the day the project was launched, more than 3,000 traders form more than 40 countries have taken part in our contests. The maximum balance of the winner of the 24th “Demo Forex” competition was $2,077,560 (initial deposit is $20,000), and the initial capital of the winner of the 27th “MegaLot” competition was increased (it’s really hard to believe) 92 times, from 1,000 to 91,931,500 USD in just 24 hours! The winners and runners-up of our contests receive real prize money transferred to their trading accounts, which can be used for trading and gaining profit at the international Forex market. A unique technological solution requires a single trading account for all contests and allows you to join any competition just by making a single mouse click at any time. A large variety of different contests, simplicity of joining any competition, and exciting impressions from the combination of thrills, chills and cold math – you can experience all of these right now! The password for luck hunters is simple – ContestFX. 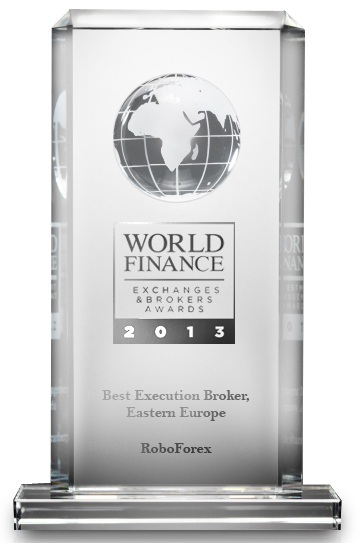 RoboForex, one of the fastest-growing international ECN Forex brokers, is proud to announce that it’s been awarded the "Best Execution Broker, Eastern Europe" by the prestigious World Finance Magazine. The “Exchanges & Brokers Awards” Award honors the top performing Brokers by region. We are delighted to have won the Award for Best Execution Broker as it recognizes the excellence of our offering and its relevance to today's private investor’s expectations. The award reflects the success of the company’s primary dedication to technology enhancement. Our clients are extremely satisfied with the superior speed of execution that we provide and we are proud to receive this award from the World Finance magazine. - The limit for a minimum deposit of $1,000 is cancelled. - The commission (for trading volume of $1,000,000) is decreased from $30 to $20 for the period of two months. Now all our clients and partners have a great opportunity to try cTrader terminal and evaluate its advantages without extra financial expenses. 02.04.2013, 9 am GMT The mind of a winning trader. Webinar about psychology of winning trader. How do professionals treat their trading? What they believe in? What is more important - entry versus risk management? How to improve your results, what tools to use to monitor your trading? 04.04.2013, 9 am GMT Top down analysis. Trader's homework. In this webinar we will uncover process of preparation to trading day. Is market trending or balancing? What key levels we should be aware of? What scenarios are in play right now, what can be anticipated in nearest future? 09.04.2013, 9 am GMT Powerful price action patterns. Part I. Candlestick and bar patterns that help us understand recent price action and anticipate futher market dynamics. Will prices continue growing or falling? Will it rotate near achieved levels? Entry and exit teqniques. 11.04.2013, 9 am GMT Powerful price action patterns. Part II. In this webinar we will continue our chart studies in order to understand what market really does and how to build profitable trading around it. Entry and exit techniques, patterns of continuation and reversal.